Takeaway #4: The Spend Safely in Retirement Strategy delivers equal or greater income throughout the life of a retiree. You want retirement checks that are reliable, guaranteed for the rest of your life, will not go down if the stock market crashes, and those you can use to pay for your basic living expenses or at least get close. Then you want to have some bonuses that have some potential to grow, but also because they are invested in the stock market that might go down. That is money you might want to use for discretionary living expenses like travel, hobbies, or supporting your grandchildren. The Social Security portion and annuities — those are your retirement paychecks. Systematic withdrawals plans (SWPs) that are invested primarily in stocks become your retirement bonuses. Part One of the Spend Safely in Retirement Strategy is optimizing Social Security — that is the retirement paycheck. Most of the time you optimize by delaying for the primary wage earner as long as possible but no later than age 70. The best way to implement this is to work just enough in your 60s to enable delaying Social Security. Part Two is from your remaining savings you are going to take the IRS required minimum distribution (RMD) to generate retirement income. That is what is characterized as your variable retirement bonus. Our forecasts are showing that if you get good returns from the stock market and you are invested significantly in stocks, you will get a real rate of return and a real bump in your retirement income. We acknowledge that many people may not want to go 100 percent into stocks with this portion, even though our analysis support that. Investing in the QDIA, either a low-cost target-date fund or a balanced fund, is also a good way to implement this strategy. This strategy, I think, works best for workers with no significant defined benefit pension and having between $100,000 and one million in retirement savings. If you have fewer than $100,000 in savings and you are in your mid-60s, that is a tough spot to be in, and I will say that strategies to deploy retirement savings do not work very well when people do not have enough retirement savings. The best options they have are to work longer, delay Social Security, and reduce their living expenses. On the other hand, if you have more than one million that can justify using more refined methods. Working with a qualified and unbiased advisor might be a good thing to do if you are fortunate enough to have savings well more than one million dollars. The Spend Safely in Retirement Strategy, compared to 292 other strategies we looked at, delivers equal or greater income throughout the life of the employee or retiree. It produces more liquidity in bequests than most annuity solutions. On the other hand, it produces less liquidity or bequests compared with pure systematic withdrawal strategies that do not use your savings to optimize Social Security. It provides low downside volatility. One reason for that is because Social Security is such a large part of your retirement income portfolio, any fluctuations in the remaining portion from the RMD are dampened and mitigated by Social Security. The next bar shows they supposedly are still retired at age 65, but they use a portion of their savings to enable a delay strategy and delay Social Security until age 70. Now their total income goes up to $51,396, a $4,000 increase compared to $47,302. They are getting a pretty big pop in their retirement income. If they can work part-time in their mid-60s to delay Social Security and enable drawing down their savings until 70 and not have to use a retirement transition bucket, then they get an even bigger bump to a retirement income of $60,234. This kind of information can help people decide if maybe they can work part-time work as a bridge into Social Security. “All I need to do is delay Social Security and delay drawing down my savings.” This becomes a viable strategy for people in their 60s that could improve their lives by having more time to pursue their interests, only working part-time, and enabling their Social Security and their savings to grow. This next chart converts the dollar amounts shown on the previous chart to replacement ratios. The dark blue represents Social Security again. That represents what I will call the bond part of your retirement income portfolio, the guaranteed part. This is showing why the light blue, if you invest that even 100 percent in stocks, you are still investing a tiny part of your overall retirement income portfolio in the stock market. Now there is another conclusion to draw from here. Look at these replacement ratios. Even if you optimize Social Security and delay until age 70, they only have a 60 percent replacement ratio, which is less than what most common retirement advisors recommend. This shows the dilemma that many people are facing as they are approaching their retirement years that they may need to reduce their standard of living significantly. 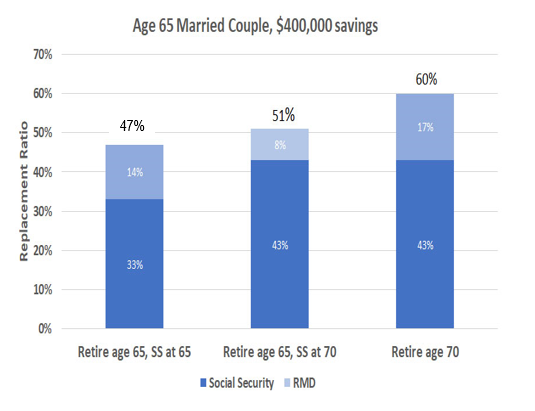 Remember a married couple age 65 with $400,000 in savings is well above the median for workers that age. This is the challenge that is facing future workers that do not have significantly defined benefit pensions and only have savings. They are going to need to figure out how to live on a reduced standard of living and is one of the challenges that you are going to face with all your employees and your customers. Thank you for helping people face this challenge. 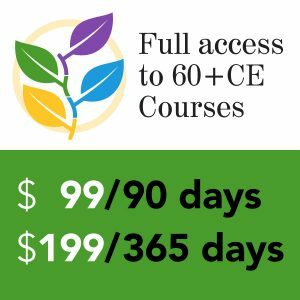 To learn more about the conclusions of this study, see “Optimizing Retirement Income by Utilizing IRAs, Retirement Plans, and Home Equity,” a joint study of the Society of Actuaries and the Stanford Center on Longevity. 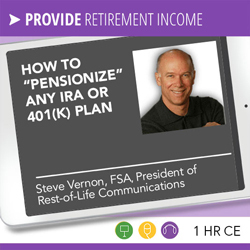 This presentation introduces the Spend Safely in Retirement Strategy, which is a straightforward method for middle-income workers to generate reliable, lifetime retirement income from any IRA or 401(k) plan. This strategy was one outcome of a substantial research project conducted by the Stanford Center on Longevity, in collaboration with the Society of Actuaries. This project analyzed and compared 292 retirement income strategies, using stochastic forecasts and efficient frontiers, powerful analytical techniques that large defined benefit plans use to devise funding and investment strategies. It then developed eight metrics to fine-tune comparisons of 21 of the most promising strategies. Using these analyses and metrics, the Spend Safely in Retirement Strategy compared favorably to the many strategies analyzed in the project. 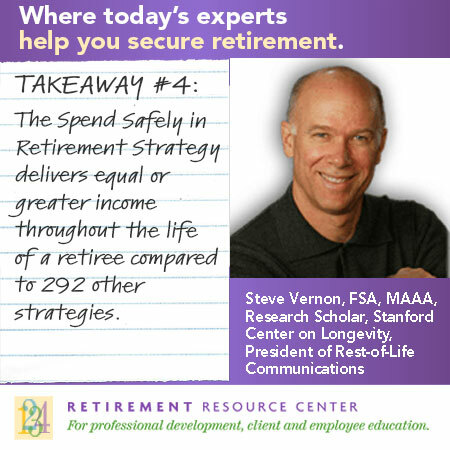 In both of his roles as Research Scholar at the Stanford Center on Longevity and as the President of Rest-of-Life Communications, Steve is active with research, writing, and speaking on the most challenging issues facing retirees today, including finance, health, and lifestyle. Takeaway #1 for Advisors: Key tradeoff decisions are required in retirement income planning. Choosing a specific solution to generate retirement income requires making informed tradeoffs between potentially competing goals. Takeaway #2 for Advisors: We compared 292 potential retirement solutions. See an efficiant frontier for potential retirement income solutions that shows their tradeoff between income and remaining wealth. Takeaway #3 for Advisors: For most middle-income retirees, Social Security represents a substantial portion of their retirement income. Social Security is the near-perfect retirement income generator for most middle-income retirees, from two-thirds to more than 80 percent of their income. Takeaway #4 for Advisors: The Spend Safely in Retirement Strategy delivers equal or greater income throughout the life of a retiree. The Spend Safely in Retirement Strategy delivers equal or greater income throughout the life of a retiree compared to 292 other strategies.